Just a few months after launching its fancy Forerunner 630 running watch, Garmin's back with an even more premium multi-sport device: the Forerunner 735. It's a combination of the brand's 900- and 600-series watches, taking the stylings of the thinner running watch but adding in the triathlon capabilities of the chunkier variant. The two key changes here are the addition of the Suffer Score, a premium feature from Strava (the 735 comes with a free 60-day trial of Strava Premium to get the most out of the facility) and an inbuilt heart rate monitor, using Garmin's own pulse monitoring technology. It's also got a greater range of inbuilt activities: alongside running, cycling and swimming (with automatic transition sensing for triathletes) the new watch will be able to monitor hiking, cross country skiing, strength training, hiking and 'general' cardio. That's combined with similar features from previous models: smartphone notifications, widgets to download using Garmin's Connect IQ store, automatic sleep or step tracking and the ability to connect to a wide variety of sensors like cycling power meters. The advanced heart rate strap from the Forerunner 630, which allowed users to track how high they were bounding or if they were overly favouring one foot over the other with each stride, is offered again as an optional extra on the new watch. 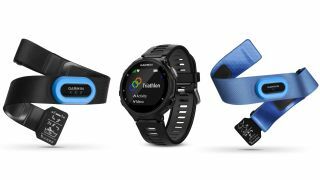 Whether Garmin will add in any features to help the average runner make sense of that, beyond looking at the numbers and shrugging, is yet to be seen. Hopefully the brand can match the stellar battery life of the previous models, and with 14 hours of training mode offered alongside 11 days of standby time it looks pretty likely – as long as you don't touch the backlight, of course. The new Forerunner 735 will eb offered in black, grey or blue for a base price of £359.99 (around US$520, AU$700), £389.99 (around US$560, AU$760) with the HRM-Run strap or a dizzying £449.99 (around US$650, AU$880) if you include the tri-bundle, which has the HRM-Tri and HRM-Swim bands as well. We're still waiting to get a specific Garmin Forerunner 735 release date, but it can't be too long now.